Animal researchers seeking to track the movements of polar bears, or Ursus maritimus, as they hunt for food were shocked by a recent discovery. One of the bears they fitted with a tracking collar has undertaken an epic journey in search of food. This particular female bear swam for 9 days straight, covering a distance of 426 miles in freezing water to search for food. The article will be coming out in an upcoming edition of Polar Biology. Unfortunately for the bear, the feat came at a high cost. Not only did the polar bear lose 22 percent of its stored fat during the perilous 9-day journey, she also lost her yearling cub along the way. The baby bear simply could not survive the swim across the increasingly perilous Beaufort Sea in Alaska. 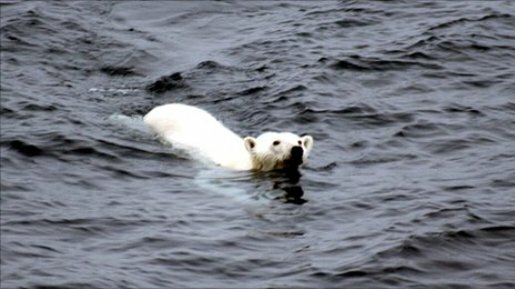 Polar bears swim from ice floe to ice floe in search of delicious ringed seals, but the warming global temperature has made the journey a bit harder.